The Gold Standards Framework (GSF) for Primary Care is a well-used evidence based systematic approach to improving the quality and organisation of care for all people nearing the end of life. 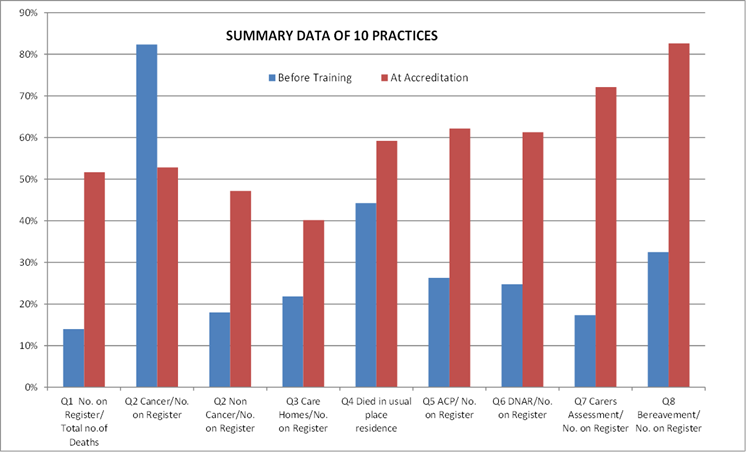 Although over 95% of UK GP practices adopt the basic principles of GSF at Foundation Level to meet their QOF targets, there is evidence that most are not using it to its full potential to help deliver best possible care for all appropriate patients in the final year of life. With the developments in policy in End of Life Care, growing use of GSF in care homes and other settings, more Locality Registers and the QIPP ‘Find the 1% campaign’, there is a need to build on the good work of many practices even further; not just Foundation Level GSF, but to ‘go for gold’. As we face increasing numbers of deaths from 2012, more with long-term conditions and radical demographic changes, there has never been a more important time to improve the primary care provision of end of life care for all patients. It helps you do this by improving earlier identification of people nearing the end of life, having and recording those crucial conversations or ‘Advance Care Planning discussions’, and enabling better coordination and team working; leading to top quality care in alignment with the wishes of patients and their families. The ‘Going for Gold’ GSF Training Programme is designed to give a new impetus to delivering high quality end of life care in primary care. It helps attain local and national policy targets, including NICE Standards, encourages cross-boundary working, and helps reduce avoidable hospitalisation leading to cost savings. There are four one-hour lunchtime sessions required as a team, with introduction and follow up, plus homework in between. There are 3 learning outcomes for each session, linked to the NICE/Quality Markers, with practical illustrations and exercises to help self-reflection and action planning, via DVD Distance Leaning. The programme helps you meet your DH Quality Markers, QIPP targets, EOLC NICE standards, and many local CQUIN targets and other local targets. The training is delivered within the practice using the resources either in hard copy, DVD or on the GSF Virtual Learning Zone. The filmed sessions include activities for the team to stop and interact, planning their own development at their own pace. There is an option of GSF in a day launch workshop for group of practices. This is a good way to launch GSF and is a very popular full or half day crash workshop, led by the GSF Central Team, covering the key elements of the programme. This is an enjoyable interactive way to convey the key messages and enables teams to return to their practices informed and ready to get going. The comprehensive programme includes everything required to run the training in your practice covering 6 sessions over about 6-9 months. Baseline and follow up Key Ratios, ADA Audits and Staff Confidence Surveys to demonstrate change. The GSF Quality Recognition and Accreditation process assesses the impact of this training on practice activity and outputs with a well-established quality assurance process.